Busato Petite Modele Model Gypsy Jazz Guitar (1943), made in Paris, France, natural lacquer finish, laminated mahogany back and sides,, black hard shell case. The guitars made by Bartolo Busato in Paris are mysterious to even the most expert chroniclers of the history of the Selmer style instruments that are de rigeur for the enduringly popular Gypsy Jazz style. Busato was one of the earliest, if not the first, independent luthiers to copy the revolutionary Selmer design and built a variety of guitars directly inspired by Mario Maccafferri's designs for decades beginning in the early 1930s. Many prominent players (including Django Reinhart himself) have employed Busato guitars since the 1930s. Busatos come in many variations, and there is some dispute as to the exact details, but nearly all agree that they are second only to early Selmer Maccafferi instruments in sound quality. This instrument is one of Busato's "petit" models. These plainer and simpler designs sold at a lower price than the Selmers, and indeed his own famous rosewood-backed Style 44. It is a 12-fret instrument with the smaller "petit bouche" oval soundhole adopted by Selmer in 1934-5. 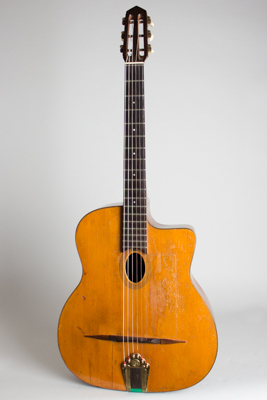 This guitar is an older 1930s pattern instrument (by the 1940s the 14-fret neck was more common), but carries a label which effectively dates it to 1943; Busato opened a shop called "Everything for Music" on 140 Boulevard de Ménilmontant in the XXth Arrondismont in Paris that year, but moved again the next -- remember that France was a battleground at this time! The instrument shows a lot of play wear, repair, and some odd features, but is a great-playing and lovely-sounding example of an authentic Parisian Gypsy guitar, something not often seen anymore -- especially in the US. Overall length is 37 1/2 in. (95.2 cm. ), 15 1/16 in. (38.3 cm.) wide at lower bout, and 3 7/8 in. (9.8 cm.) in depth at side, taken at the end block. Scale length is 25 in. (635 mm.). Width of nut is 1 11/16 in. (43 mm.). This guitar has seen a lot of playing, as well as numerous repairs over time, which is typical with these original Selmer-style guitars. The top has a decent amount of pickwear, with a Flamenco-style tap plate added for protection. There are two spruce grain cracks behind the bridge on the bass side of the top, sealed but visible. The neck is somewhat unusual, made of a single piece of mahogany but with a three-piece stacked heel; many Busatos have a two-piece heel but this is the only one we have seen with three. It may be an old repair, but there are several small doweled holes in the lower section; this may just be the exigencies of wartime Paris. The fingerboard appears to have had a shim added underneath to raise it up (also known as a "Classical neck set") and the guitar plays very well. All of the finish appears decades old, but based on the repairs we would assume at least some of it is later than the guitar. The bridge is also a more recent handmade compensated rosewood piece. While this is not a collector-grade guitar, it is a wonderful-sounding and playing authentic Parisian instrument with tons of character. Overall Very Good Condition.